When Garrett Bewkes became National Review’s head publisher, his first order of business was to modernize the legacy publication as digital-first. He began with the email program, which typically batch-and-blasted generic templates to a fairly disengaged audience. That’s where Sailthru came in. Our Strategy & Optimization team spent more than 80 hours analyzing every email template, engagement metric, conversion rate and more. Together with the National Review team, we then created a roadmap to take the publisher’s email strategy above and beyond. This sample cohort is one of hundreds our team viewed in order to develop the best recommendations. The goals included improving engagement across all KPIs, while decreasing opt-outs and increasing pageviews. It was ambitious… but achievable. In the space of a year we helped National Review increase pageviews per thousand emails sent by 387%. In addition, clickthrough and open rates improved by 142% and 96%, respectively. In the past, National Review’s email marketing could have been described as high volume-low engagement. This resulted in unsustainable opt-out rates. There was little in the way of automation, segmentation and personalization, all of which we set out to change. Our Customer Success and Deliverability teams developed a solid suppression strategy for who would receive what emails and when. They also identified which audiences needed a break from National Review, scaling back messaging to prevent them from opting out. 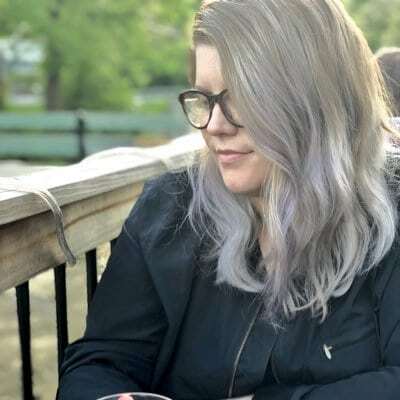 To keep from inundating disinterested subscribers with tons of email, the publisher also consolidated its two weekend newsletters based on historical engagement. The opt-out rate stabilized and steadily decreased. At the same time, engagement rose. National Review’s template formats contained formatted in such a way that all the content was inside in the email messages. That strategy works for some, but not ad-driven publications since there’s little incentive to click through. We helped National Review reformat and test their templates to make sure they follow best practices, while providing the best user experience and generating more pageviews. While we were at it, we made those templates more personalized. Rather than send everyone the same email, we populated most messages with a combination of recommended and curated content. They were partially personalized based on behavior and interest, but National Review still had some semblance of editorial control. However, the National Review‘s NR Daily newsletter is now fully personalized and dynamic. The template automatically populates the top stories of the moment and other evergreen content most likely to resonate with each reader. 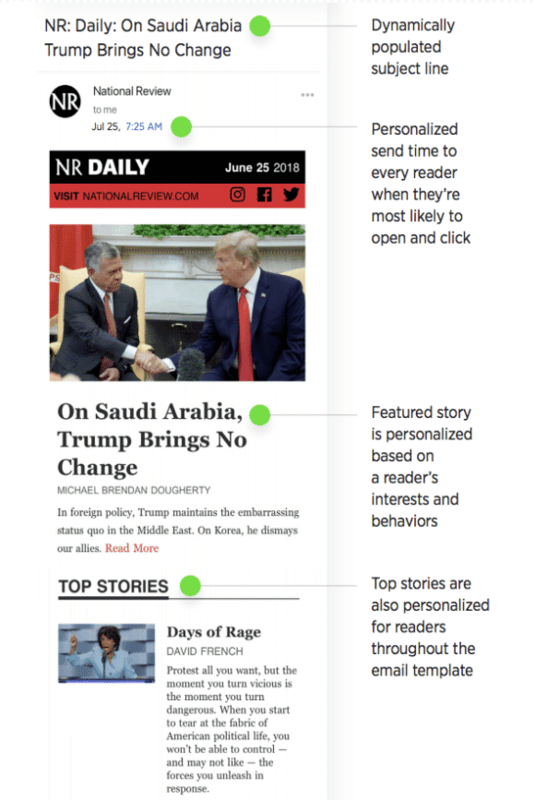 Using our dynamic scripting language, the National Review also personalizes subject lines based on those stories, lightening the load for their marketing team. The publisher even personalizes send times, factoring in what time people typically open and engage with their emails. Many email service providers encourage clients to send more, more, more. However, that’s often self-serving advice. The more you send, the more we can charge. That’s not our approach. At Sailthru, we view client success as a driver of our own. Sometimes less is more, which was the case with National Review’s email strategy. 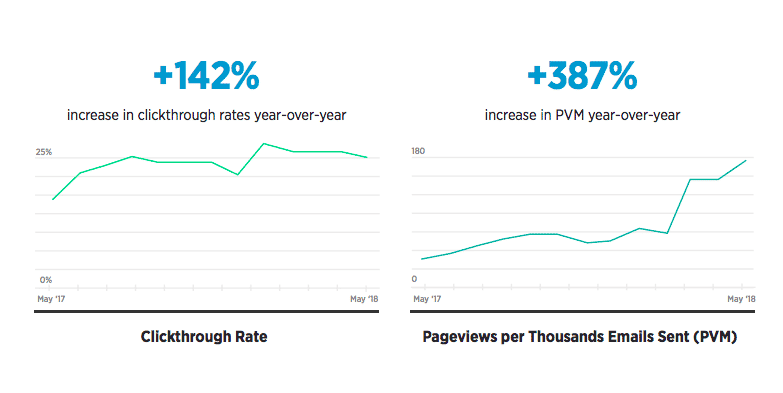 With proactive monitoring — as well as weekly client meetings and a mid-year business checkpoint review — we helped the publisher do more with less. Now, the team prioritizes quality over quantity, with fewer emails that drive more pageviews and clicks.